Small - $93.99 Medium - $93.99 Only 1 left! All ready to be everybody’s favorite pretty, pink princess? 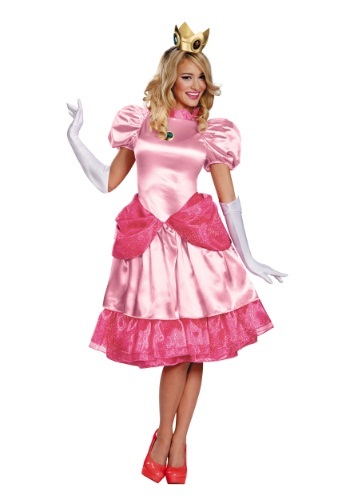 Alrighty then, grab this officially licensed Princess Peach Deluxe Adult Costume and let the adventure begin! Halloween is no time to waste being held as a prisoner by that fire-breathing monstrosity, Bowser. That sounds horrible… Instead, get your friends to dress up as Mario, Luigi, Toad, and Yoshi, and bring your favorite Nintendo games to life! Grab a couple of our plushy red shells and enjoy reliving the golden days of Mario Kart while racing around the party scene. Go head to head against your friends in mini games designed to resemble your favorite Mario Party games. Unless you free-run regularly, we would suggest staying away from the classic 2-D Super Mario Bros game play… there’s a whole lot of jumping and it becomes more tiring than fun in the real world. When you’re done competing with your friends for trophies and golden stars you can show off the royal dance moves that only a princess of the Mushroom Kingdom would know. Mario may be known as the “hero” in the relationship, but it’s time to show everyone that Peach isn’t a stereotypical damsel in distress. No, she’s a dancer! We think that you’re more than ready to adventure with plumbers and rule a majestic kingdom. All you need to do is pop on this beautiful pink dress, grab an elegant pair of elbow length gloves, and top of this fantastic transformation with the included sculpted golden crown. Then your Nintendo-themed Halloween will be ready to begin!